Jacinda Ardern has become the first New Zealand prime minister to walk in the country’s gay pride parade. 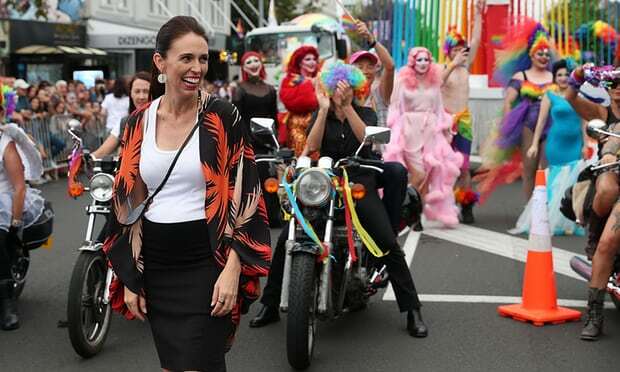 More than 25,000 people watched the parade in Auckland on Saturday night, cheering as the prime minister strolled down Ponsonby Road flanked by her finance minister, Grant Robertson, a gay man, and Louisa Wall, a Labour MP who is gay. Although the prime minister did not partake in some of the more exuberant fashions, she got into the swing of festivities by dancing, taking selfies with admirers and bestowing hugs on members of the crowd.